As we are in the midst of the season of giving, we may sometimes forget that the most important part of the holiday season is simply giving. This can be the most difficult “gift” to give since giving requires one to also lend some time. I often find myself saying “I never have enough time”, and before I know it, time is already gone. One of the most important times in anyone’s life is the time that passes between birth and 6 years old; this is the time when we learn subconsciously, and everything gets soaked up. So for this Montessori Method Update, we will focus on the importance of communicating and applying the Montessori Method of communication into our daily lives with our children. 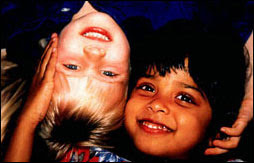 The Montessori Method emphasizes the importance of treating children with respect and appreciating the fact that no two children are the same. It is this simple truth that highlights the effectiveness of communicating in the Montessori Method. According to this methodology, communicators (i.e. teachers and parents) must be attentive to their words AND nonverbal cues. By using positive words and speaking courteously (i.e. saying “May I?” and “Please), communicators can create an encouraging environment while enforcing respectful behavior. Also, speaking calmly and warmly especially when a child is exhibited “undesirable behavior” will influence your child to react in the same manner. Finally, since children, notably young children, use nonverbal communication often, the Montessori Method calls on communicators to pay attention to the subtle movements that children make. By addressing what children say without words, we give value and a voice to the message the child was silently communicating. The Montessori Method for communication can be implemented in our daily lives, but the place where it is most often needed but not used is during television. When your children are watching television sit and enjoy the show with them; television programs often contain scenarios and words that are too complex for their young minds to understand. By watching television with your children, you will increase your children’s understanding and also create lasting memories. In addition, you can monitor what your kids are exposed to, limit television time and also explain what is occurring during a program. Watching television should be an enjoyable time for your children, and with you by their side, your children will also gain the priceless gift of your time. Of course, time is always slipping away, but when you do have a moment, we hope that you and your children are able to create memories to last a lifetime.